For more than a decade, ecologists have used the term “marine subsidy” to explain the phenomenon in which terrestrial or land-based animals, including birds, take advantage of energy derived from marine ecosystems, sometimes without going into the water. An excellent case in point involves a predatory group of gull-like birds called skuas. Found in both northern and southern polar regions, skuas scavenge and prey upon nesting seabirds whose young and eggs they consume, and whose parents they rob when the latter are transporting food back to their nestlings. All of the food involved comes from the ocean where the skuas never hunt, hence the term “marine subsidy.” Without these subsidies from the sea, skuas themselves would not be able breed successfully. The Turkey Vultures I am studying on the Falkland Islands also depend upon marine subsides in the form of dead and dying nestling penguins…at least in summer, that is. In winter they depend on “human subsidies” to support their scavenging lifestyle. In the Falklands these subsidies consist of table scraps and other food items that vultures find in an around farms during winter, and after the penguins have left. And Falkland Island vultures are not alone in this regard, although the human subsides themselves often differ regionally. In the Old World, evidence suggests vultures have been feasting on humanity’s largess for thousands of years, first by following the domestic livestock of nomadic peoples and feeding on dead and dying sheep and goats, and more recently, on the farm scraps left by sedentary agriculturalists. Presumably the same has happened in the New World. That vultures continue to do so today whenever and wherever the distribution of farmers and vultures overlap suggests the critical importance of this human assistance. From pig farms to chicken ranches and beyond, today’s vultures relish the opportunity to clean-up after rural humans. And it doesn’t stop there. Populations of hooded vultures in West Africa concentrate in and around large and small cities, where they take advantage of the lack of modern sanitation, feasting upon human garbage wherever it occurs– both within and outside of landfills–as well as at “unsanitary” slaughterhouses whenever offal is available. And the same is true for black and turkey vultures in the New World. The urban parks of many Central and South American cities provide both feeding and roosting opportunities for tens of thousands of black and turkey vultures, as do the region’s zoological parks. In northwestern Venezuela, for example, the Maracaibo Zoo is home to more than a thousand turkey vultures that roost in the zoo’s trees and feed both upon the food given by zookeepers and the human food left behind by visitors. Several years ago we used this “vulture-magnet” zoo to catch and wing-tag more than 450 migrant vultures that were overwintering at the site, more than three dozen of which were later spotted in North America. Turkey vultures appear to be remarkably quick learners when it comes to human subsidies, at least in coastal Chile. Enormous numbers of marine mammals and seabirds breed in the region because of the massive fish populations living in the near coastal Humboldt Current. 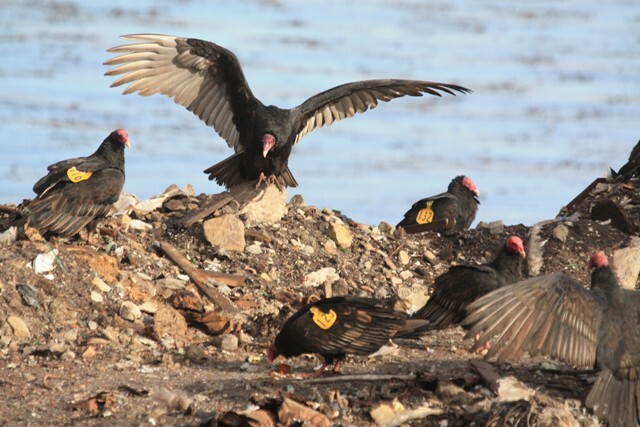 When I visited the area several years ago I wasn’t surprised to see turkey vultures feeding upon washed-up marine mammal and seabird carcasses as part of this marine subsidy. I was, however, quite surprised to see vultures tracking the availability of local human subsidies inland as well. My initial plan for visiting coastal Chile was twofold: 1. assess the vulture populations there and 2. study their flight behavior in the coastal zone. The latter, unfortunately, turned out to be impossible. The plan was simple enough, to drive along the Pan American coastal highway, pull over and step out of the car with binoculars to study the flying vultures I happened upon. The birds, however, had a different idea. More often than not when I pulled over the bird in question headed straight for me, stopped, and then circled directly above. A simple experiment explained what was going on. With two turkey vultures circling overhead I left the remainder a fast-food lunch in a white paper bag along the side of the road, got back into the car, drove half a mile down the road, and stopped and looked back at the bag. In less than several minutes, the vultures had landed at the bag and were tearing it apart. 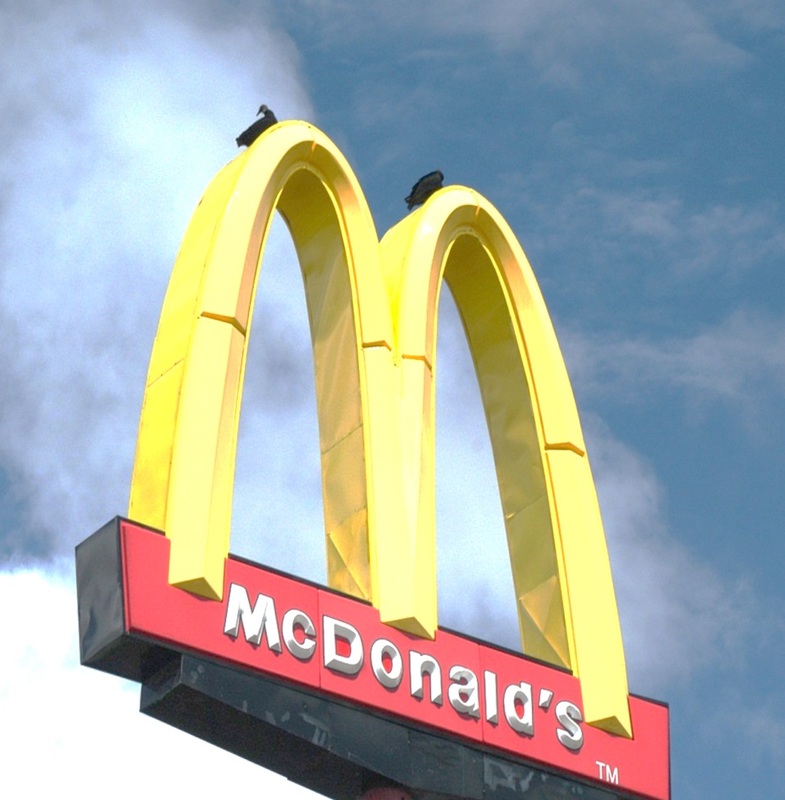 These birds–and presumably many others–knew that people stopping on the side of the road typically discarded their leftovers, and their reactions to stopped cars reflected that. My most recent experience with “human subsidized” vultures–and the event that prompted me to write this blog–occurred on a trip to the deserts and scrublands of southern Nevada. Two days of surveys along hundreds of miles of roads in the area yielded not a single turkey vulture. But as soon as I entered the Valley of Fire Nevada State Park east of Las Vegas, I had no trouble spotting individuals circling over the park’s camping grounds, obviously seeking out human leftovers. In Nevada, the birds knew exactly where the “predictable” human subsidy was. A vulture’s dependency on human subsidies is not without consequence, however. “Modern” sanitation is significantly reducing human-subsidized feeding opportunities for both New and Old world vultures. And it, together with high levels of toxic chemicals in areas that humans inhabit (including human drugs in urban areas, and agricultural pesticides in farmlands), are just a few of the problems scavenging birds of prey now face. How all of this will affect local and regional populations of vultures remains unknown. Nevertheless, vultures still serve as useful “sanitation engineers” for humans, and we, in turn, still manage to help subsidize their food base in many areas. The trick in maintaining this mutually beneficial relationship–we provide the leftovers and the vultures clean up after us–is to minimize the costs and maximize the benefits of continuing this delicate balancing act. Unfortunately, recent examples of catastrophic declines of vultures in Africa and southern Asia, suggest that we still don’t know enough about vulture biology to manage this successfully. One of our principal challenges at Hawk Mountain has been, and continues to be, creating a better understanding of the curious nature of scavenging birds of prey. To this end we are now ratcheting up efforts to study vultures in Africa as well as in the New World. Although we are learning more about vultures “hand-over-fist,” our ignorance is such that we are likely to be at it for some time. To learn how you can help support our efforts, call (1-570-943-3411) or email me (bildstein@hawkmtn.org) at the Sanctuary. Assamo, the Egyptian vulture we are tracking via satellite in the Horn of Africa has moved to southern Djibouti, and so it seems that he/she is really not going to migrate this year. We don’t yet know whether Assamo is an “African” vulture or one that will try to breed in Europe or Asia. It may take some time (years) for this to be revealed. 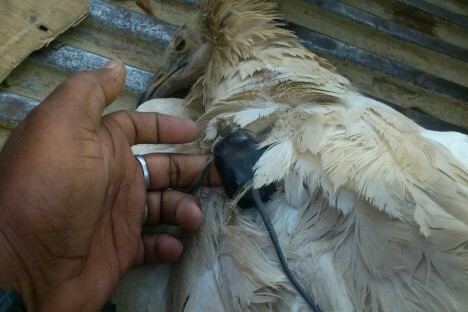 Have a look at the Egyptian Vultures in Djibouti blog for information on Assamo’s recent movements. I guess that now that Assamo has been into Ethiopia the title of that blog is not entirely accurate. Below is a map of Assamo’s locations over about 12 hours on 4-5 April (Hint: If you click on the map, it will open in another window and be much clearer). 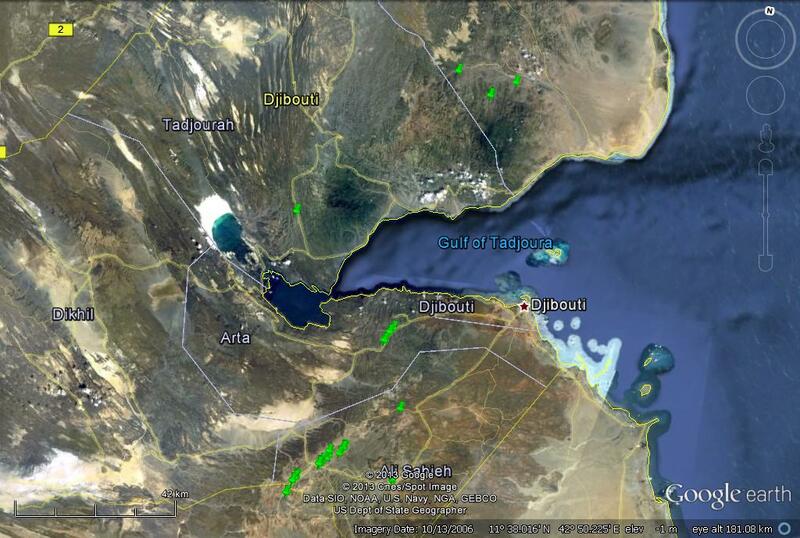 These locations are east of the Djiboutian town of Ali Sabieh. 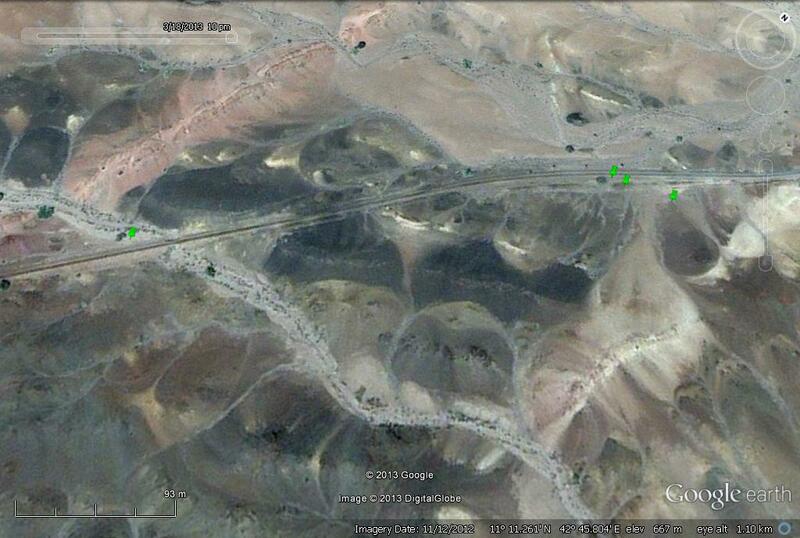 As you can see, they are very close to the road. 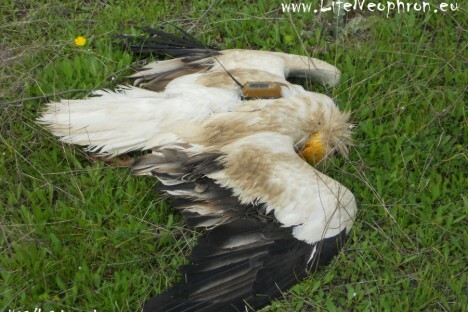 One often sees Egyptian vultures on or close to roads in Djibouti as they scavenge for road kills. Maybe this is what Assamo was doing.